We are proud to show our commitment to service, tradition and innovation through our Annual Reports. We wish to thank all the members who participated in the 68th Annual Members Meeting held on Monday, February 18th, at the Spanish Cultural Center on Alemany Blvd., in San Francisco. With over 300 in attendance, members were treated to the traditional breakfast followed by a presentation on the state of the Credit Union by President & Chief Executive Officer Kathy Duvall. 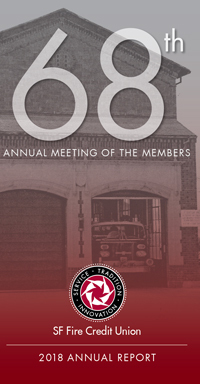 The next Annual Meeting of the Members is scheduled for Monday, February 17, 2020.